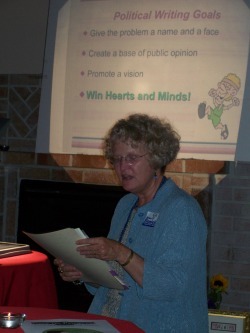 “Vote Your Hope.” “Think globally, act locally.” “Yes we can.”These are all examples of what political organizer and policy entrepreneur Barbara Graves referred to as “whittling down your message” at the October 20 installment of the Pizza and Prose Art & Literature Series. Anyone can write a letter to the editor, an op-ed piece, or a blog these days, but to be effective, according to Graves , you need to be succinct and speak from your heart. Graves shared a recent letter to the editor from a local newspaper. The author had clearly done research. There were facts and figures galore, but no heart. There was not one personal tie-in to the issue at hand and no one in the audience was even mildly convinced of the author’s argument even though there were a few good points in the article. Then she read a letter she had written several years ago which was basically about not letting shopping malls and big chain stores take over the charm of the city and put independent owners out of business. She started her letter telling the story of how Robinson’s pharmacy had saved her life. The example of how a small town pharmacist caught her drug allergy in a mistaken prescription by her doctor got the audience to sit up and take full notice. The flow of the letter kept the groups’ focus as she described the sad day when Robinson’s went out of business. It was lost to the pressure that many independent owners deal with in this world of big chains buying them out. Big chains are not likely to have pharmacists who are looking out so closely for the health and well-being of their customers. In this survival of the fittest business culture the small time owner is the little fish that gets eaten by the big sharks. As Graves pointed out in her letter the big fish do not have the taxpayer’s interests at heart when they sell us a bill of goods on how economical and convenient it will be to have them in our neighborhood. Instead of simply using facts and figures she used her own story to draw the audience in and illustrate her point. Then she used facts to strengthen her argument. And this is how she mobilized a community back when she wrote the letter and hand delivered it around the neighborhood. Graves ended the evening by teaching the audience the union clap that starts out slowly and builds to a faster and faster pace. She then handed out words to the various versions of union songs that have been sung to the tune of The Battle Hymn of the Republic, written during the Civil War by Julia Ward Howe. Ralph Chaplin first rewrote it as the union anthem, Solidarity Forever in 1915. Where we work for half men's wages for a boss who likes to flirt. Maybe with more women finding their voices and coaching others as Barbara Graves does we can look back 30-40 years from now and not feel as affected by these words now as the women who sang them in the 70’s. In the mean time maybe we can take a page from her book: try to whittle down the message, write up our politics and win the hearts, minds, and respect of those bosses who even if they don’t flirt like they used to, still amazingly don’t give equal pay for equal work. Yes, we can! Can’t we?